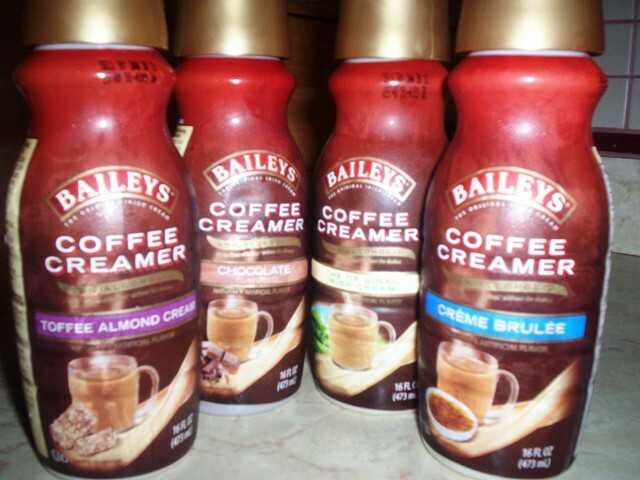 The wonderful folks at Baileys ( #1 liqueur in the world ) have come out with a new line of premium coffee creamers (produced by HP Hood). They contain no alcohol and come in 7 popular flavors : French Vanilla, Hazelnut, Caramel, Irish Cream, Creme Brulee, Toffee Almond and Chocolate. They all come in 16 oz. containers with the French Vanilla, Hazelnut and Irish Cream being available in a 32 oz. size also. If you're lucky you'll find them in your grocer's refrigerated section. If not, they'll be coming soon. They're set to sell around $2.50 for the 16 oz. and $4 for the 32 oz. 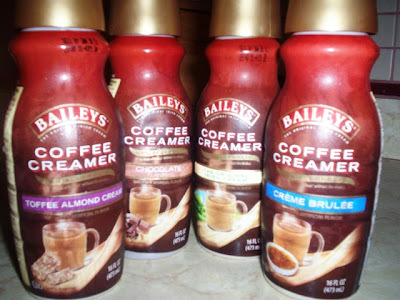 Now I tell you all this because the Baileys folks very kindly sent us some samples to try for ourselves. We were very surprised when 4, 16 oz. containers arrived, securely packaged, at our door. It contained 1 each of Chocolate, Toffee Almond, Creme Brulee and the original Irish Cream. How generous. We couldn't wait to try them. THE VERDICT: Delicious ! I'll give them my highest honor....when we run out of our samples, I'm running out to the market to purchase some more. Not only were their distinct flavors fantastic tasting but the product seemed to change the consistency of the coffee itself. The coffee seemed so much more creamy and smooth. Best of all the flavors were spot-on. The Irish Cream tasted like Baileys, the Chocolate added a hint of chocolate and the Toffee.....well, you get it. We couldn't have been more impressed with these great tasting creamers. So thank you, Baileys! Thank you for creating a great new product and thank for for so generously sharing it with us. Don't forget to visit our friends at MenuJoy.com for great restaurant menus.